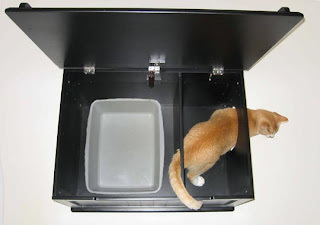 I have been struggling to determine if these are ridiculous or great solutions to the general unattractiveness that is the litter box. 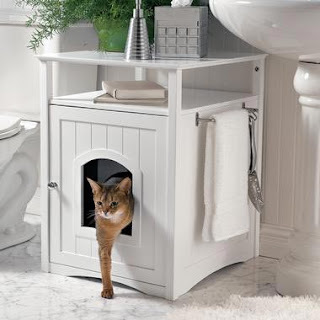 Usually some speckled light pink or gray, the traditional litter box just sits in the corner accumulating dubious stains. If i had a cat and a house in East Hampton, I've concluded that this would be appropriate. I actually have this (the white one) and it is the most wonderful thing I've ever purchased for a pet. Living in an apartment— space is tight, its not like I have a huge laundry room to set up at a litter box haven. With this, its actually a functioning piece of furniture. It sits in my hallway, has a lamp and a potted plant on it, and most of the time, people don't even notice that its got a hole in the front. My cat actually frightened a friend of mine by popping her head out of it at the right time. Anyway, I adore mine and just wanted to share!